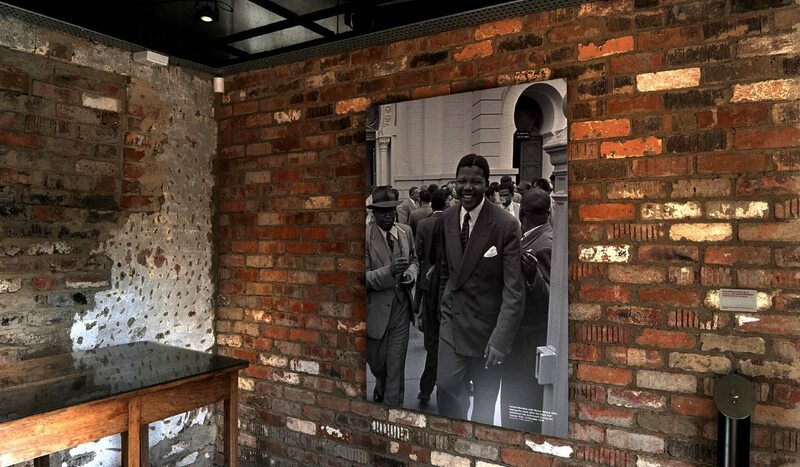 “Coming here was a chance to learn about South Africa’s history. I think where we come from ensures that we learn from our history and that we don’t repeat it.” These were the words of 13-year-old St John’s learner Delela Ndhlela, who had been chosen by his history teacher to represent the school at Liliesleaf. It wasn’t difficult to understand why. He spoke eloquently on the importance of the Rivonia Trial in Apartheid history and his love for the subject. He looked every bit the young academic in his private school blazer and tie. Ndhlela was one of many teenagers packed into the Liliesleaf auditorium to hear Talk Radio 702 broadcasting live from the thoroughly revamped, restored and renovated farm, providing a vivid sense of what the place looked like 50 years ago. It was obvious that South Africa’s youth was the focus of the historical day. For the under 20s, it must be hard to imagine a rural Rivonia of the 1960’s, now an upmarket suburb of Johannesburg, and even harder to imagine that one of the most important events in our history took place not far from the temple of commercialism, Sandton City. It was on the farm 50 years ago that South Africa’s most prominent anti-Apartheid activists, including Walter Sisulu, Govan Mbeki, Raymond Mhlaba, Andrew Mlangeni, Elias Motsoaledi, Ahmed Kathrada, Billy Nair, Denis Goldberg, Lionel “Rusty” Bernstein, Bob Hepple, Arthur Goldreich, Harold Wolpe and James “Jimmy” Kantor attended meetings and were ultimately arrested. Demonstrating an understanding of their target demographic, Talk Radio 702 partnered with the Liliesleaf Trust and used South Africa’s most popular social media tool, Twitter, to encourage interest in the historical day. Using #RivionaRaid, 702 ran a “live feed” of the events leading up to the raid and got thousands tweeting back at them. What better way to get young people interested in our past than to have it coming at them in conveniently sized 140 character bites, couched between jokes about the Ashes or the impending royal birth? The Liliesleaf Centre for Memory and 702 cleverly enticed young people on the day, too, playing groovy music from the Apartheid era to tell a distant and complicated story of separateness. The 1960s tunes served the dual purpose of bringing the historical day to life for the under-20s and getting the oldies feeling nostalgic. “Through the music we will take you on a journey to the country we were living in [in] the 1960s where everything was controlled. Fifty years ago South Africans were living in two worlds. Blacks and whites couldn’t listen to the same music. Even though 50 years is half a century ago it is only yesterday in culture terms,” said 702 music guru Sean Brokensha. The playlist had to be cut short, however, when Deputy President Motlanthe arrived. Excited to be in the presence of a man they knew only from TV, the kids quickly got out their phones to post a “twitter pic” of Number 2 for their friends who were stuck at school. Motlanthe spoke of the importance of the Liliesleaf Trust in the context of South Africa’s history and tourism industry. “You can’t put Robben Island in context without a visit to Liliesleaf, just as you can’t understand the Apartheid Museum without coming here first,” he said. Motlanthe also encouraged the audience to “take stock of how far we have come and whether we are still on track for that vision,” adding that “the purpose of marketing days like these is to make us reflect and think, whether we have given effect to those visions or not” admitting that in some respects we have not. Speaking to the school children after the event, it became obvious that these were not just any young people and certainly not the ones Wolpe was talking about. These kids knew their Apartheid history and the significance of the Rivonia Trial. In fact, they could probably tell you more about the details of the day than their parents could, thanks to their private school curriculum and diverse classrooms. Many of them spoke with enthusiasm about their history classes and history teachers and expressed delight at being chosen to attend the special day at Liliesleaf. They genuinely seemed excited by the message behind the memory project and not just by the famous faces, finger foods and time off school. But 50 years after South Africa’s most famous activists were sentenced to life in prison at Rivonia for their beliefs, last week’s audience showed there was still a long way to go. Looking around the Liliesleaf auditorium, there was no doubt that we had made progress towards the vision Motlanthe spoke of. Black and white girls and boys leaned over each other to compare their Instagrams and laugh at tweets, but these kids all had something in common – their private school status. On 11 July 2013, 20 years since the end of constitutional segregation, where were the kids of Soweto, Alexandra, Tembisa, Diepsloot and Kagiso? Why were they not at Liliesleaf to absorb and contemplate their history? After all, it’s the history of separateness that continues to affect them. That they were excluded from the Liliesleaf 50th anniversary event shows that South Africa has not yet achieved that vision.